About: Judy’s sculpture is pure magic. 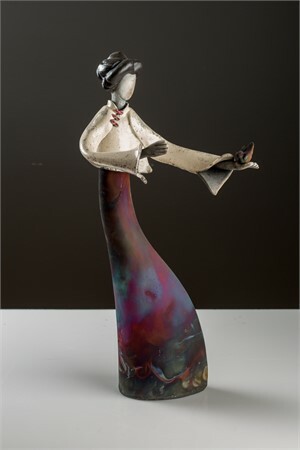 Her specialty is Copper-flash Raku, an Americanized version of the traditional 16th Century Japanese firing process. Some of that Asian flare and a lyrical motion seeps into her amazingly detailed figurative pieces. 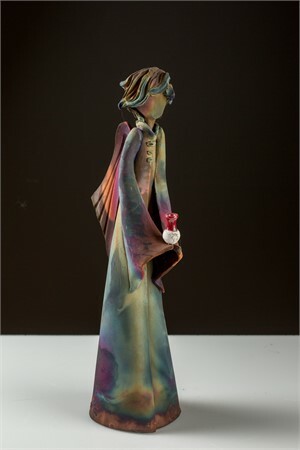 Judy began sculpting in 1993 at Ox-bow, a residential school of art Saugatuck, Michigan, School of the Art Institute of Chicago.what she creates from the flames is a blend of science and color built on the art she loves. Process: Raku is a firing method in which the piece is removed glowing hot from a 2000° kiln and placed into combustibles. The resulting smoke and flame create a serendipitous display of vivid color on copper patina and unique carbon patterns on a piece’s unglazed areas. Artist Statement: “I very much enjoy finding that “sweet spot” where I can maximize the beauty of the color with the figure which I have hand built. Achieving a repeatable palette with a very unpredictable process is for me one of life’s great adventures.” -Judy Geerts About: Judy’s sculpture is pure magic. Her specialty is Copper-flash Raku, an Americanized version of the traditional 16th Century Japanese firing process. Some of that Asian flare and a lyrical motion seeps into her amazingly detailed figurative pieces. Judy began sculpting in 1993 at Ox-bow, a residential school of art Saugatuck, Michigan, School of the Art Institute of Chicago.what she creates from the flames is a blend of science and color built on the art she loves. Process: Raku is a firing method in which the piece is removed glowing hot from a 2000° kiln and placed into combustibles. The resulting smoke and flame create a serendipitous display of vivid color on copper patina and unique carbon patterns on a piece’s unglazed areas.